I often have a difficult time choosing my favorite dessert. 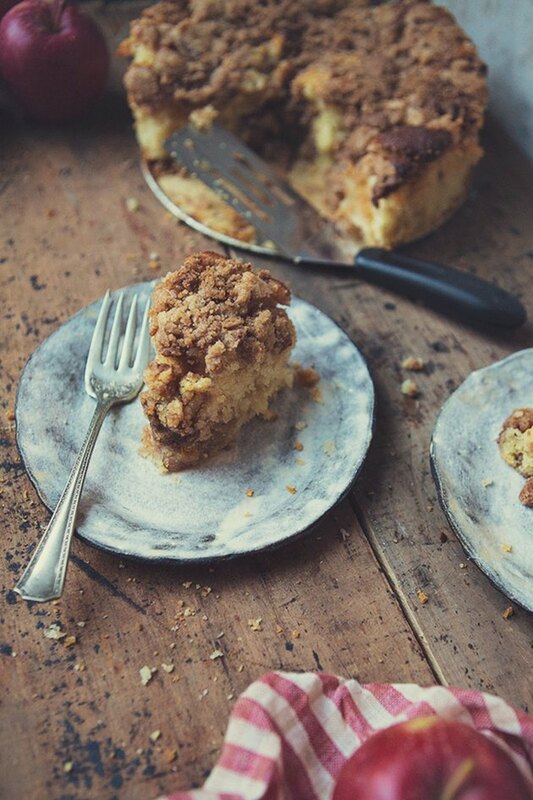 Is it the classic apple pie, its crisp crust and warm apples tumbling from between the layers? Perhaps it is apple crisp, so easy to put together and yet entirely satisfying with its crumbled cookie goodness and soft cooked apples hiding underneath. 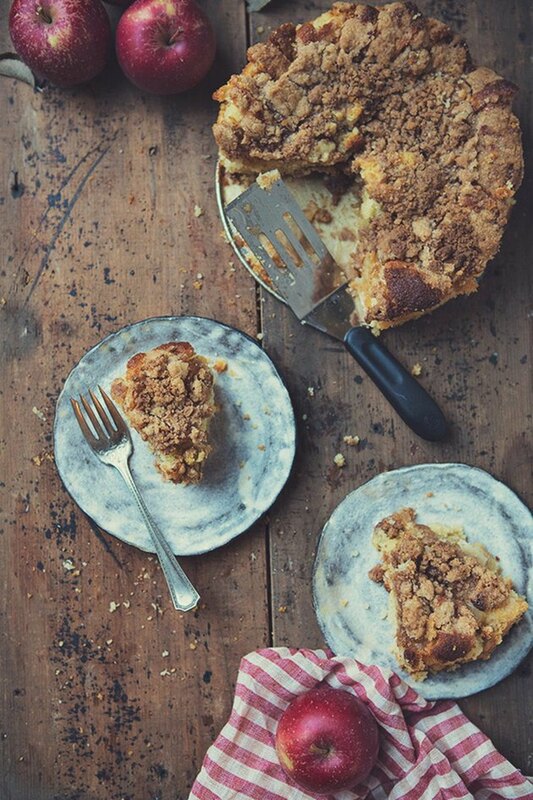 And then there’s the coffee cake, perfect for both morning or evening activities, the apples dotted throughout the light, moist cake. 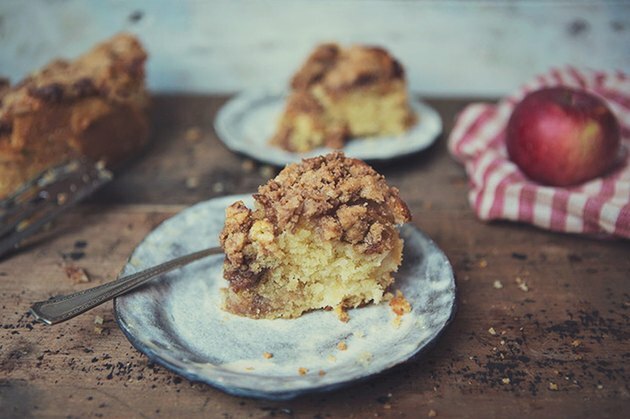 This cake combines all three: the coffee cake with its apple bits, topped by a layer of warm apples dusted lightly with cinnamon and then topped with a apple pie spiced crumble. Serve it with your weekend brunch, or slice it after dinner. It has a home on both ends of the day. Preheat the oven to 375 degrees F. Grease the bottoms and sides of a 10-inch cake pan and set aside. In a large bowl, cream together the butter and sugar until light and fluffy. Add in the vanilla and eggs, and beat until well mixed. In a separate bowl, combine the flour, baking powder and salt. Add the flour mixture and stir to combine. Slowly stir in the milk and mix until smooth. Add in the diced apple and stir to combine. Pour the batter into the cake pan. Arrange the sliced apples over the batter, fanning them out and pressing them lightly into the cake. In a separate bowl, combine the remaining butter, flour, sugar, cinnamon, nutmeg and cardamom. Mix with a fork until crumbled. Pour the crumbles evenly over the top of the cake. Bake for 80 minutes, or until the center of the cake is set and the top is golden brown. Remove from oven and cool slightly before serving. Serve warm, or cool completely and store in an airtight container until ready to eat. This recipe makes 8 to 10 servings.